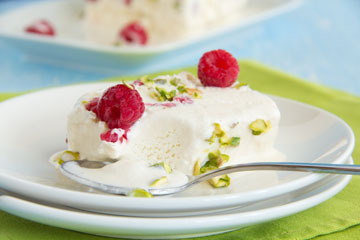 Meaning “partially frozen” in Italian, semifreddo will maintain a soft, velvety texture – even right out of the freezer. Semifreddo contains so much sugar and air, it will never freeze into a hard, dense block like ice cream. To make a semifreddo you don’t need an ice cream maker or any other special equipment – just a hand mixer. It’s so easy to whip one together you’ll want to give it a try for your next summer event, or maybe just because it tastes so good, and it’s just so darn hot outside. Line 9x5x3-inch metal loaf pan with plastic wrap, leaving a generous overhang. Sprinkle the chopped and toasted pistachios evenly over the bottom of pan. Using an electric mixer, beat whipping cream in large bowl until soft peaks form. Refrigerate whipped cream while making the custard. Whisk 1-1/4 cups sugar, egg yolks, lemon juice, lemon peel, and salt in large metal bowl to blend. Set bowl over large saucepan of simmering water and whisk constantly until yolk mixture is thick and fluffy and instant-read thermometer inserted into mixture registers 170°F, about 4 minutes. Remove bowl from over simmering water. Using electric mixer, beat mixture until cool, thick, and doubled in volume, about 6 minutes. Fold in chilled whipped cream. Transfer mixture to prepared loaf pan and smooth top. Tap loaf pan lightly on work surface to remove air pockets. Fold plastic wrap overhang over top to cover. Freeze semifreddo until firm, at least 8 hours or overnight. When ready to serve: Gently mix the berries and remaining 1/2 tablespoons sugar in large bowl. Rest for 20 minutes in the refrigerate until cold. Unfold plastic wrap from top of semifreddo and invert dessert onto platter; remove plastic wrap. Dip heavy large knife into hot water; cut semifreddo crosswise into 1-inch-thick slices. Transfer to plates; spoon the raspberries over the top. Now is the time to hit the Farmers Market for some of the seasons best produce. This recipe is loaded – lettuce, onion, corn, tomato, chilies, cilantro, avocado and even lean ground bison meat. Then pile on the toppings with your customize Taco Topping Bar! Add some of your favorite vegetables, cheeses, avocado, and sour cream. Or mix up your own version of this recipe by adding in some chopped summer squash, zucchini or even baby eggplant. Ground bison is available at most Farmers Markets, Whole Foods or Fresh Market. Heat oil in a large skillet over medium heat. Add onion and cook, stirring often, until softened and lightly browned, 8-10 minutes. Add garlic and jalapeno and season with salt and pepper. Cook, stirring, until garlic is fragrant, about 1 minute. Add chili powder, cumin, and coriander and cook, stirring, until spices are fragrant, about 1 minute more. Add ground bison, season with salt and pepper, and cook, breaking up with a spoon, until meat is cooked through, about 5 minutes. Add tomatoes, corn, and ½ cup water and bring to a simmer. Season again to taste with salt and pepper and cook, stirring occasionally, until the liquid is reduced slightly and tomatoes are soft about 8-10 minutes. 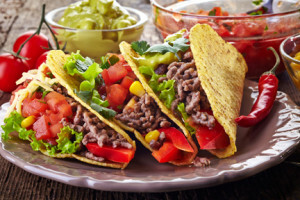 Serve with your favorite Taco Topping Bar selections.